Hey, Look, Encouraging NHL Lockout News! We're a two-team city now, and we cannot subsist on Seth's Knicks Power Rankings alone. Thus, the Nets Power Rankings, written by the excellent Devin Kharpertian from The Brooklyn Game. Enjoy. Where was I? Oh, right. 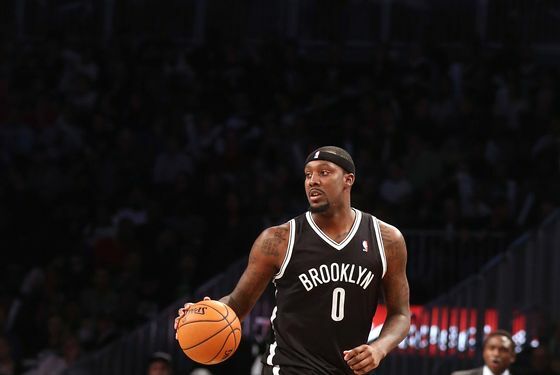 Blatche has been phenomenal in these last three games. He's forced less offense than usual and is somehow scoring more. He's looked tricky in the post in good ways, with dekes and ball fakes galore, and gotten points in the paint from Deron Williams feeds on a few occasions. He's still having issues defending, particularly in help — there was one moment when Blatche stuck his hip to Kendrick Perkins as he watched Russell Westbrook fly through the lane for an uncontested layup, which is probably something you don't want. But he's grabbed 28 rebounds and has a team-leading plus-minus of +4 per game in the past three games. For his efforts, Dray Day becomes Dray Week. 2. Deron Williams. Williams gets bumped from the top spot thanks to the Blatche Mob, but in actuality Williams had a solid week, punctuated by finally getting his shooting touch back on Tuesday night against Oklahoma City. Williams hit ten of twenty shots and five of nine threes — including one from the first "A" in the "BARCLAYS CENTER" lettering on the floor, which is stupidly far — en route to 33 points, his highest-scoring game of the season. Hopefully that's an indicator of things to come and not an anomaly. 3. Gerald Wallace. Wallace was fined $5,000 by the NBA Tuesday for his second violation of the league's anti-flopping rules, for lunging backwards after minimal contact with LeBron James. But other than that, Crash has been back with success: he's hit bunches of three-pointers and played the standard "Gerald Wallace is out of his mind" brand of defense we've come to know and love. 4. Kris Humphries. Humphries got off scot-free after his altercation with Rajon Rondo — no suspension or fine — and deservedly so, Humphries was acting in self-preservation and self-protection as Rondo tried to take the shirt and skin off his back. Since then, he's been kind of a bore. He's seen a slight uptick in his minutes with Lopez and Evans limited, but hasn't had a spectacular or breakout showing on the glass or scoring. He's gotten some nice shots to go, notably a fourteen-foot jumper and a couple of easy dunks, but he's fitting into a fifth-option role in this offense without much upside. 5. Joe Johnson. My new theory: Joe Johnson has an evil twin, named Mo Johnson. Joe is a nice guy, and as the good twin, he believes in the power of humanity. He wants to give Mo some shine, and a chance to better himself, so he gives Mo a shot to play in some Nets basketball games under the guise of being Joe. But Mo's no good. Mo will never be good. Joe thought he set a good example with solid shooting nights against the Clippers, Blazers, and Magic, but Mo don't care. After Mo game-flopped his way through Tuesday night's Oklahoma City contest, Joe took the reigns back in the fourth quarter and turned Mo's ugly 4-15 night into a slightly more respectable 8-21 one. Hopefully, Joe will one day understand that good doesn't share a bunk bed with evil — it triumphs over it. Let's keep Mo off the floor forever. 6. Jerry Stackhouse. Stackhouse, notable for his invention of palindromes, began his free-fall back to reality this week; in the two games since we last power-ranked, Stackhouse has shot 2-10 from three-point range, bringing his three-point percentage all the way down to a puny 44.7 percent. Oh: And against Oklahoma City, Stackhouse STILL led the team in plus-minus, with a +10 in 29 minutes, and leads the NBA in plus-minus per 48 minutes by a full 5.5 points. 7. Reggie Evans. I just learned recently that Reggie is short for Reginald. Reginald Evans missed a game with the flu on Tuesday but played about to what you'd expect against Miami — he averaged roughly one rebound every three minutes, hit his only shot (a layup) in fifteen minutes, and had a semi-dramatic defensive impact in the game, as he and the bench mob often do. Good on you, Reginald. 8. Keith Bogans. Bogans is an odd nut to crack: He's shot poorly, doesn't do anything that shows up in the box score, but teammates love him and the team's defense performs significantly better (about seven points per 100 possessions better) with him on the floor. He's a solid one-on-one defender and smart enough to grasp Avery Johnson's defensive concepts, but I'm just not sure how much of that is the structure of randomness and how much of it is Bogans' impact. 9. C.J. Watson. Watson was the team's bench mob darling early in the season, but has fallen off after his hot start. Watson's best when he can create havoc in the backcourt — he just hasn't done it lately. 10. Mirza Teletovic. One thing is clear about Mirza Teletovic: He has absolutely no conscience. Hopefully one day he'll have a consistent three-point shot, too. 11. MarShon Brooks. Had a shot to play his way into the rotation and didn't take advantage of it. With Jerry Stackhouse playing as well as he has for the time being, the struggling Brooks doesn't have much of a role in this rotation. Who would've thought THAT sentence would ever be written? 12. Tyshawn Taylor. Barely played. Pass. 13. Josh Childress. When a player does absolutely nothing of box score consequence in a game — no field goal attempts, free throw attempts, rebounds, assists, blocks, steals, turnovers, fouls, or points — it's called a "trillion," because the box score will show the minutes played next to nothing but zeroes. In related news, Childress has already notched four "trillion" games this season, including one that lasted eight minutes and three seconds. To be fair, two of them were under sixteen seconds — but even that gives you an idea of where Childress sits in this rotation. 14. Brook Lopez. PLEASE COME BACK. Devin Kharpertian is the managing editor of The Brooklyn Game.